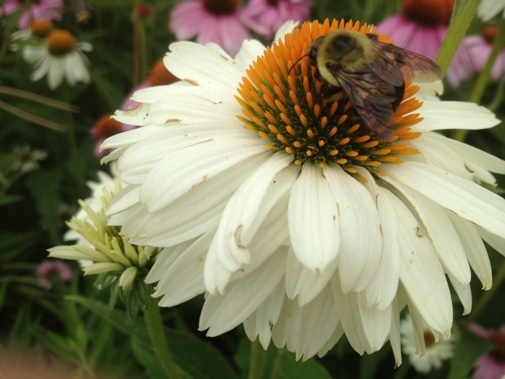 Comments Off on Everyone loves a coneflower-with-a-bee-on-it photo! 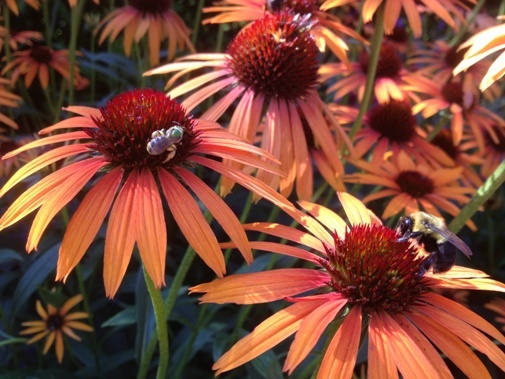 And what better way to share our amazing coneflower collection than with the bees busily working on them. Featured here is Echinacea purpurea ‘Tangerine Dream’ (hybrid coneflower) amoung many in the Show Garden, north side. 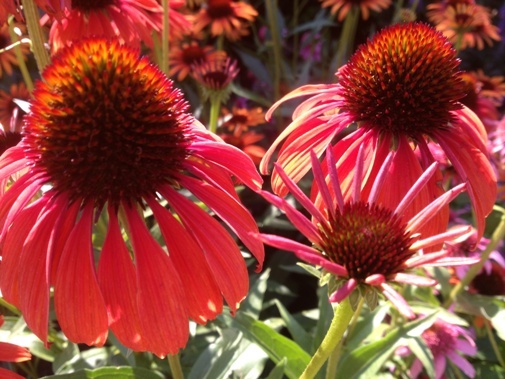 Echinacea ‘Firebird’ (coneflower) displays scarlet red rays with an orange-brown cone. 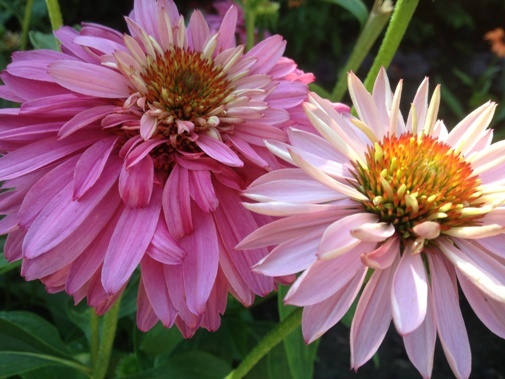 Echinacea ‘Pink Poodle’ (double purple coneflower) has fully double pink-petalled flowers, over a bushier plant. 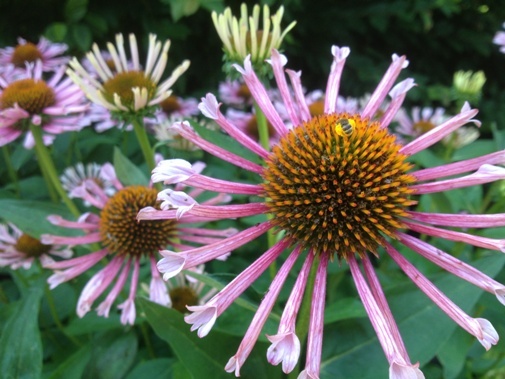 Echinacea ‘Quills and Thrills’ (coneflower) has quilled purple-pink petals surrounding an orange cone. 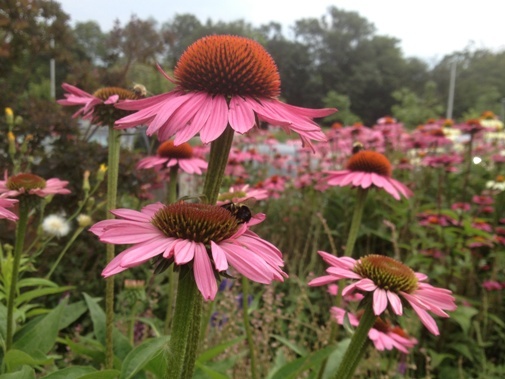 A tried & true purple coneflower, Echinacea purpurea ‘Magnus’ in the Entry Garden, with accompanying busy bees. 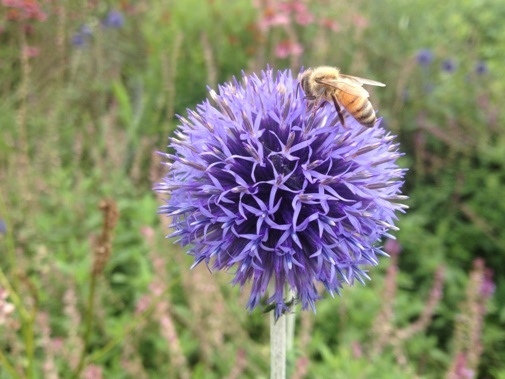 The bees are lovin’ Echinops ritro ‘Veitch’s Blue’ (small globe thistle) as much as the coneflowers – which make great companions in the Entry Garden. 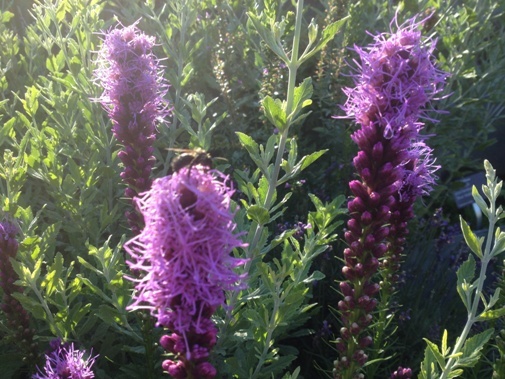 Liatris spicata (blazing star) is punctuated throughout many of the gardens, another great perennial to combine with Echinacea purpurea. 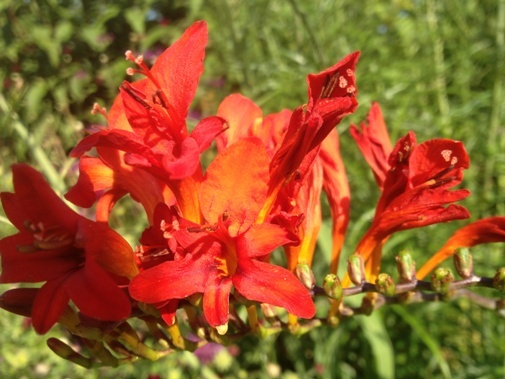 Just across the walk in the Entry Garden, you will also spy Crocosmia ‘Lucifer’ (crocosmia) partnered with coneflowers. The brilliant orange-red colour of these cousins to gladiola are sure show-stoppers.